An exhilarating true story that reads like a spy thriller about a former CIA operative recruited out of Iran, while he served as a member of the secretive and highly feared Revolutionary Guards of Iran. This exhilarating, award-winning memoir of a secret double life reveals the heart-wrenching story of a man who spied for the American government in the ranks of the notorious Revolutionary Guards of Iran, risking everything by betraying his homeland in order to save it. Reza Kahlili grew up in Tehran surrounded by his close-knit family and friends. But the enlightened Iran of his youth vanished forever, as Reza discovered upon returning home from studying computer science in the United States, when the revolution of 1979 ushered in Ayatollah Khomeini’s dark age of religious fundamentalism. Clinging to the hope of a Persian Renaissance, Reza joined the Ayatollah’s elite Revolutionary Guards. As Khomeini’s tyrannies unfolded, as fellow countrymen turned on each other, and after the deeply personal horrors he witnessed firsthand inside Evin Prison, a shattered and disillusioned Reza returned to America to dangerously become “Wally,” a spy for the CIA. 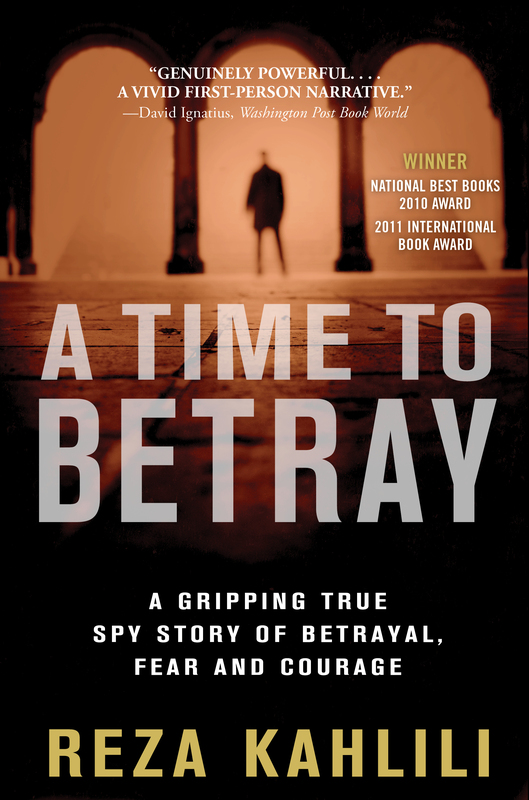 In A Time to Betray, Reza not only relates his razor’s-edge, undercover existence from moment to heart-pounding moment as he supplies vital information from the Iran-Iraq War, the bombing of Pan Am Flight 103, the Iran-Contra affair, and more; he also documents a chain of incredible events that culminates in a nation’s fight for freedom that continues to this very day, making this a timely and vital perspective on the future of Iran and the fate of the world. “I WAS FOLLOWED,” I said. I swallowed hard and said, “Yes. I understand.” It was difficult to miss Agent Clark’s message: I was disposable. It was 1981. The revolutionary Islamic government had been in power in Iran for more than two years. In that time, it had ensnared my country and my people in its brutal grip. I had seen friends executed in cold blood, their last look carved in my memory forever. But now, I was as far away from that government as I had been since the revolution, in a safe house high above California’s Malibu. Making plans to return to my homeland as a spy. The world’s most powerful intelligence agency had given me the code name Wally. I never thought to ask them why they chose it. It was hard to believe that I looked like a Wally in their eyes, but maybe that was why they gave the name to me. The assignment they asked me to undertake would have been dangerous for any Iranian. But I was not just any Iranian. I was a member of the dreaded Sepah-e-Pasdaran, the Ayatollah Khomeini’s Revolutionary Guards. I stared at the number for a long time, trying to keep my feelings in check. I was terrified at the thought of where my return to Iran would lead me. The Revolutionary Guards looked everywhere for spies. No one was above suspicion. And they were likely to be especially wary of me when I got back. I hadn’t just traveled out of the country; I’d gone to the United States, a sworn enemy. They knew I’d gone to college in America and I’d given them a good reason for my being there now, but they would certainly question me when I returned. How would I hold up to their scrutiny? If they caught me, I knew what would happen. I had seen what they did to spies and to those who opposed the government. The Guards drugged them, raped their wives and children in front of them, and gouged out their eyeballs, all in an effort to get them to talk. I thought of my wife, Somaya, and shuddered. As they did every day, the visions came to me of what I had witnessed in the infamous Evin Prison, where the government kept political detainees. They’d paraded teenage girls in front of me as they led them to their deaths. These girls were barely out of their childhood, barely old enough to think for themselves, much less form thoughts against the state. They knew nothing about the machinations of politics. They were innocent in every sense of the word and certainly innocent of the trumped-up charges that led to their imprisonment. Yet they suffered fates too brutal for even the most vicious criminal. None of these girls would ever know the joys of romantic love. None of them would ever hold her own baby in her arms. Their few remaining moments of life had been filled with a level of abuse few can imagine. I didn’t protest. This made sense, of course. Agent Clark might have been comfortable with me and confident about my motives, but if I were a professional spy on behalf of the Revolutionary Guards, they would have trained me to behave exactly as I had in the CIA’s presence. The lie-detector test was insurance. Agent Clark arranged for the test to take place in the Hacienda Hotel in El Segundo, just south of Los Angeles International Airport. I entered through the restaurant, as instructed, and walked to the back hall. This led to a bank of elevators. From there I headed to room 407, taking the stairway instead of the elevator to make sure no one was following me. At the room, I used the key Agent Clark had given me. He was already there. The agent administering the test arrived shortly thereafter, carrying an oversized briefcase. He didn’t offer his name, only nodding instead. I noticed that he’d tied the knot on his thin tie too tight. Though I wasn’t hiding anything from the CIA, I began to feel a hint of panic. The agent must have noticed this, because he smiled and told me to relax. Doing so was not going to be easy for me. As the agent unpacked his equipment, my heart pounded. I glanced at Agent Clark and he offered me a reassuring look. This did little to calm me. The other agent explained the process, telling me what each of the several wires coming from the machine did. The agent would be reading my nervous system, which I had disciplined myself to control, though I wasn’t doing the best job of it right now. I eyed the door. For just a moment, I considered making a break for it. I would find some peaceful place where neither the CIA nor the Revolutionary Guards could find me. But then I remembered the executions. The hangings. The torture. My friends. And my resolve returned as never before. The agent asked me to sit down and roll up my sleeves. He hooked the wires from the machine to my arms, wrist, fingers, and chest. Sweat formed on my forehead. Agent Clark moved into the second room of the suite, closing the door behind him. The other agent told me to look straight ahead. He sat to my right, adjusted himself a couple of times, and said he was going to ask some questions; all I needed to do was answer with a simple yes or no. He bent over, concentrating intently as a roll of paper extruded from the machine, his pen ready to make notations. I noticed that several of the questions seemed repetitive, with nuanced differences. I wondered if this was the agent’s attempt to trip me up. I was sweating heavily at this point. This made the places where the agent had attached the electrodes itchy. The agent watched me shift in my seat and then made a notation. I wondered how badly my obvious nervousness was hurting my chances. The agent turned back a couple of pages to where he had been. I felt a lump in my throat as a tide rose in my chest. My eyes brimmed with tears. I had left home a respected member of the exclusive Revolutionary Guards. I would return a jasoos, a spy betraying my country. I knew that if my father were alive and found out what I was doing, he would turn his back on me. I knew that my grandmother, who taught me to be a devoted Muslim and to be honest and trustworthy, would be ashamed of me. How could I be a spy if I could not hide my emotions and provide fast answers to provocative questions? I had joined the Guards with the purest intentions. I believed at the beginning of the revolution that the Islamic movement was fair and just, carrying the promise of a nation’s salvation. Instead, I had witnessed brutality, murders, and lies committed in the name of God. I had witnessed the destruction of a nation. Because of this, I was about to embark on a life of treason. I was going to lie to my wife, lie to the people I loved most. I was going to risk their lives without giving them the chance to protect themselves. The CIA saw me as a godsend, an asset they needed at a time when they were struggling to understand the threat that Iran had become to them. If I was going to help them, they needed to know what made me tick. Yet I wasn’t sure I could explain myself to them. How could I make them understand why I was risking my family and betraying my friends to save my country when I wasn’t sure myself? For the first time since I’d begun this journey, tears broke over the edge of my eyes and dripped down my cheeks. The question split my soul in two. Because the two people inside me had contradictory answers. And God would not send half of me to hell.